The first report of an attack came from the Al Noor mosque, located in central Christchurch. The police commissioner said "multiple fatalities" were recorded at two locations. The attack, which came around the time people were attending the mosques for Friday prayers, was the deadliest in the nation's history. A gunman live-streamed footage of his rampage to Facebook, filmed with a head-mounted camera. The footage showed him firing indiscriminately at men, women and children from close range inside the Al-Noor mosque. Facebook said it had removed the gunman's Facebook and Instagram accounts and was working to remove any copies of the footage. The suspect who was charged appeared to have published a manifesto before the attack outlining his intentions, in which he identified himself as a 28-year-old Australian citizen and espoused far right and anti-immigrant ideology. 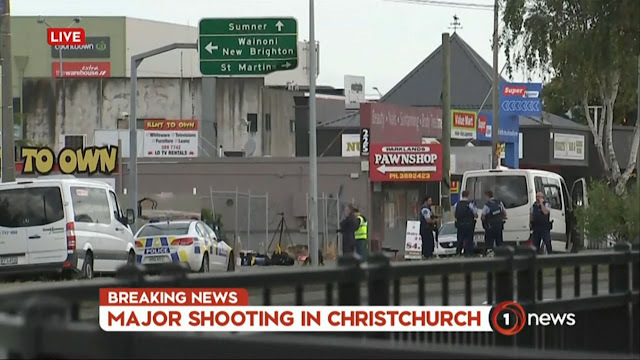 "It is clear that this can now only be described as a terrorist attack," Prime Minister Ardern said in a press conference. We hold you in prayer as we hear the terrible news of violence against Muslims at mosques in Christchurch. We are profoundly aware of the positive relationships we have with Islamic people in this land, and we are particularly horrified that this has happened at a place and time of prayer. We are deeply saddened that people have been killed and injured, and our hearts go out to them, their families and wider community. We wish you to be aware of our solidarity with you in the face of such violence.